This article is about the Disney Princess. For the Indiana Jones character, see Elsa Schneider. 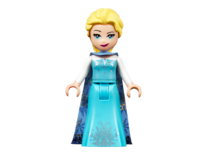 Elsa, also referred to as Queen Elsa, is a Disney Princess mini-doll figure introduced in 2015. Elsa has two variations, both have the same hair and head. She swept back cool yellow tied in a medium length braid. At the back and top of her hair there is a place to put hair accessories such as crowns and flowers, for example the set 41062 Elsa's Sparkling Ice Castle suggests you put a lavender bow in her hair. Elsa has light nougat skin. Elsa has black eyebrows over her light blue eyes. In the centre of her face she has a small rounded nose. Below her nose she has an open smile which portrays her gnashing her teeth, her lips are decorated in bright purple lipstick. Elsa's torso in 41062 Elsa's Sparkling Ice Castle shows the upper part of her gown. Her torso is teal with square and rectangular sliver sparkles to the sides of her torso. Elsa's arms are aqua and her hands are bare, leaving them light nougat. Her leg piece displays the lower part of her dress which is also decorated in sliver sparkles to the bottom. In 41068 Arendelle Castle Celebration Elsa wears a lime gown. Her top's neckline is outlined in lavender and there ars various silver and magenta flowers printed on it. Her arms are bare, leaving them light nougat. Elsa's dress is mainly lime, but there ars dark blue and magenta flowers printed at the bottom. Elsa, crown princess of Arendelle, is born with the elemental ability to create and control ice and snow. As a child, she uses her abilities to create a winter wonderland to play in with her younger sister and best friend, Princess Anna. One night, Elsa accidentally harms Anna with her powers. The king and queen of Arendelle hurriedly take Anna to a tribe of mountain trolls to be healed. While healing Anna, the trolls inform the royal party that Elsa's abilities will grow, becoming both beautiful and very dangerous so she must learn to control them. While the trolls erase Anna's memory of the incident and of her elder sister's powers in general, Elsa is traumatized by the event. The king and queen begin taking measures to control and hide Elsa's ice abilities: the castle gates are locked, and Elsa is shut away in her bedroom for most of the time. She is given gloves to help suppress her powers and is told to suppress her emotions as well, but her powers continue to grow even stronger and she becomes constantly fearful of harming those she cares about most. Meanwhile, Anna is hurt and confused by the sudden loss of contact with her elder sister and tries without success to coax her out of her room. Their parents, the king and queen, are later killed in a shipwreck when the sisters are teenagers, leaving both feeling even more isolated. As Elsa becomes a young adult, she is set to formally succeed her late father and be crowned Queen. Though she is afraid of opening the castle to the large crowds, the coronation goes on relatively peacefully. However, at the reception, Anna asks for Elsa's blessing to marry Prince Hans of the Southern Isles, whom she had met earlier that day. Elsa refuses to condone Anna's engagement to someone she barely knows, triggering an argument between the two. As Elsa becomes upset, she accidentally exposes her abilities. Upon the guests' horrified reactions and being accused of sorcery and called a monster, Elsa flees the castle and retreats into the icy mountains. In the process, her emotions unleash an "eternal" winter throughout Arendelle. While there, she decides to finally embrace her powers and builds an enormous ice palace where she believes she can live freely without fear of hurting others. She also reconstructs her childhood snowman, Olaf, and unknowingly brings him to life. Anna, determined to find Elsa and bring her back, travels through the mountains, encountering Olaf and a mountain man named Kristoff. They reach the ice palace, and Anna attempts to persuade Elsa to return home and mend their relationship. When Elsa resists, Anna tells her about the state Arendelle was left in. 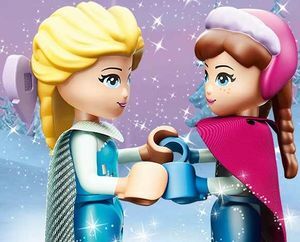 Horrified, Elsa lashes out and accidentally freezes Anna's heart. As Olaf and Kristoff rush to Anna's aid, Elsa demands that she be left alone, creating a giant snow creature to force them out of the palace. 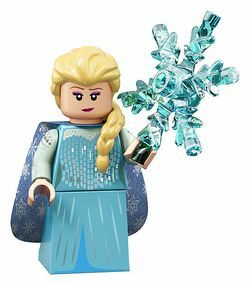 Elsa is branded a monster for cursing Arendelle in solid ice and snow, and the ice castle becomes darker and more grotesque, reflecting her torment and reignited fears. Meanwhile, Anna becomes increasingly weaker, and Kristoff takes her back to the trolls, who tell them that only an act of true love can save her life. Anna and Elsa reuniting after Anna's act of "act of true love"
Hans and a group of soldiers attack the ice palace. Hans convinces her to spare two soldiers who attempted to assassinate her and thus prove that she is not a monster. However, she is knocked unconscious and taken to her castle's dungeon. Hans visits her and urges her to end the winter, but she admits that she does not know how to. After he leaves, she is able to break free from her chains by freezing them and escapes the cell, though her fears trigger a massive blizzard. Anna returns to the castle, believing that a romantic kiss from Hans will be the "act of true love" to save her. Instead, he informs her that their engagement had been the first step of a plot to get him the throne of Arendelle. Olaf tells Anna that Kristoff is in love with her, and she believes that his kiss will cure her. As she and Olaf rush to find Kristoff, Hans confronts Elsa nearby and tells her that she has killed Anna. Devastated, Elsa collapses and the blizzard stops suddenly. Hans approaches her and swings his sword to kill her. However, Anna turns away from an approaching Kristoff with her last bit of strength and blocks the blow as she freezes solid. Moments later, Anna begins to thaw, as her choice to save her sister rather than herself constituted an "act of true love". Elsa realizes that love is the key to controlling her powers, and ends Arendelle's eternal winter. Summer returns to Arendelle, Elsa regains the throne and is able to use and safely control her powers, while the sisters' bond is restored. Some time after these events, Elsa throws Anna a surpise birthday party, however Elsa had caught a cold prior to this and unknowingly creates small living snowmen known as Snowgies every time she sneezes. The Snowgies cause problems for Krisoff and Sven who are waiting for Anna with decorations and her birthday cake, but manage to get them under control for when Anna arrives. Elsa is eventually convinced by Anna to go to bed and rest, while Kristoff, Sven and Olaf take the Snowgies to Elsa's ice castle to live with the giant snowman, Marshmallow. This page was last edited on 24 March 2019, at 00:42.